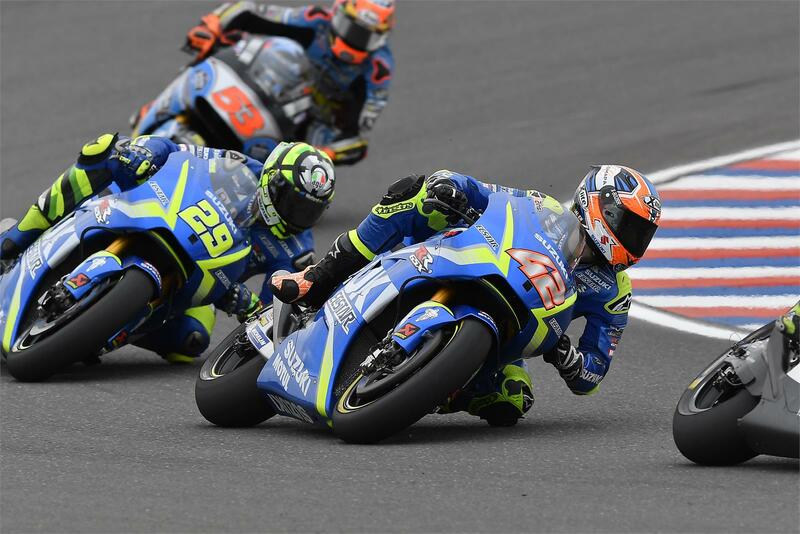 The GP of Argentina turned out to be a very tricky one for Team SUZUKI ECSTAR, with both Andrea Iannone and Alex Rins out of the points after the 25 laps of the race. The Italian ended his race in 16th place, while the Spaniard had to give up after 14 laps due to the pain. The whole race had been a tough one for Iannone: stuck in the pack right after the start, he lost some positions after another rider crashed into him from behind; he managed not to crash his own bike, but lost precious positions. Then he was penalised with a “ride through” for a jump start he did at the beginning. This put him in the difficult position to catch up from the very bottom of the pack and ruined his race. His pace was very positive, close to the top riders, but not enough to close the gap. He finished in 16th place. Rins ran into trouble and had pain in his right ankle. Jumping from the last place in the grid, he was able to advance his position, moving up to 15th place at the end of first lap and transition into 14th after lap 6, but then unfortunately he incurred in a crash in lap 7 after an overtake. He was able to rejoin the race from the bottom, but this required major exertion on his injured ankle, and he opted to withdraw. “The truth is that it has been a tough weekend. We knew it would be hard due to the injury, and in fact it hurt me for the whole three days, but we wanted to start the race and in the end, we achieved it. Despite jumping from the very back, I’m pretty happy with myself because I managed to stay cool and make an excellent start. During the race I felt pretty comfortable with the ankle, it didn’t hurt too much, but I felt bad with the braking. After some laps in 15th place, I tried to overtake in the only possible corner - the entrance of corner 13, and managed to get into 14th place, but then I lost control of the front end and crashed. It was not a bad crash but I hit my foot and the pain increased, thus not allowing me to finish the race. Now it’s time to look ahead and go to Austin. I like that circuit very much and I hope to recover a lot with some rest and physiotherapy during these days, in order to arrive in Texas in considerably better condition.